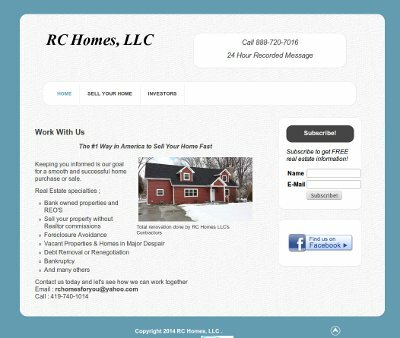 Website Design Completed For RC Homes, LLC. Bob from RC Homes, LLC contacted us less than a week ago asking about getting a website created for his real estate investment business. He didn’t know what to expect and wasn’t sure how to get started. BsnTech Networks came through and gave him a great degree of detail as to how websites work along with our structure for creating a website design for his business. Bob quickly made the initial payment to get started and we setup his web hosting and his domain name. We then requested the information to start on his website – which he sent to us about 24 hours later. In less than three days, his website is now fully completed and published! We appreciate the business from Bob with him entrusting us to build his website. RC Homes, LLC’s website is at rchomesforyou.com.